Airplane travel is stressful at the best of times, but when it comes to flying with small children, it can be downright miserable. From flight delays and lost baggage, to turbulent weather and sore ears, family vacations aren’t always what we dream they will be, but with a little planning and preparation and this collection of the best toys for airplane travel, it doesn’t need to be that bad. In fact, you might even find yourself ENJOYING the experience if you have the right tools at your disposal. I’ve been flying with my daughter since she was 10-months-old, and while I have always been a very nervous flyer, I’ve gone out of my way to make the experience as fun as possible for my little girl. We’ve done a lot of long-distance traveling together in the last 6 years, and while we’ve had a few bumps along the way – like the time she developed a stomach bug at 35,000 feet – she absolutely loves to travel. Because I am the queen of finding the best toys for airplane travel, and always pack her a special bag filled with inexpensive but entertaining things for her to do to pass the time. I start collecting things a few weeks in advance before each of our trips, allowing me to take advantage of sales and order things online, and I make sure to have a combination of toys and activities my daughter can play with both independently and with my husband and me to ensure she doesn’t get bored. 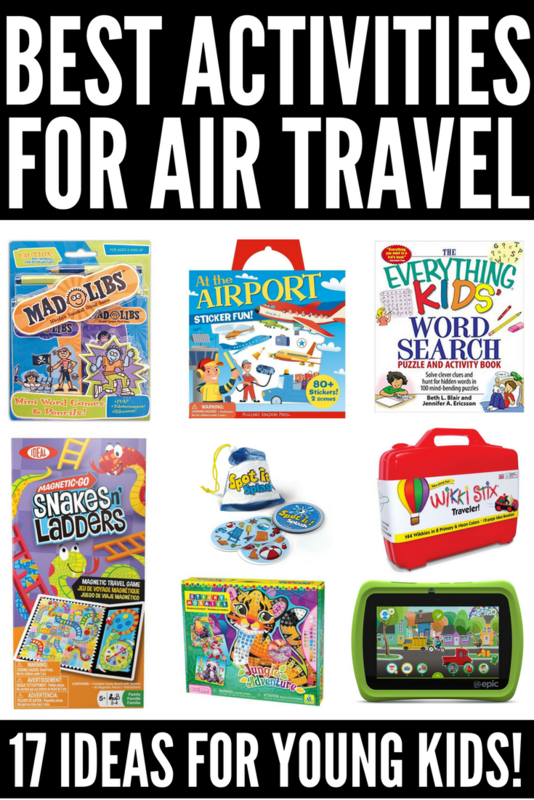 Ensuring I have a bag filled with the best toys for airplane travel has been one of the BEST traveling tips I’ve ever been given (read more of my tips for traveling with kids here), and I’ve rounded up 17 of my top choices below. Perfect for toddlers and older kids, this set comes with 2 background scenes and over 80 reusable airport-themed stickers for hours of independent play. My daughter enjoys sticking these to her window, and I find this set offers a great distraction when you’re waiting to take-off and/or taxiing around the airport after landing. And when your kids lose interest, simply pack them back into the tote for later use! Busy Books are one of the greatest inventions ever. I’m serious! They come in a nifty little story box with full-page illustrations, a story, 12 figurines, and a playmat, and they offer hours of imaginative fun. They offer so many different TV shows and movies to choose from – Paw Patrol, My Little Pony, Doc McStuffins, Bubble Guppies, Finding Dory… You get the idea! I ditch the box and put the figures and play mat in a ziplock bag for easier transport. No trip is complete without a little fun with play-doh! I used to just pack a few pots of play-doh and hope for the best, but I’ve since learned how fun (and compact) play-doh sets can be at 35,000 feet! I’m currently crushing on the Play-Doh Breakfast Time Set, but there are HEAPS of different options to choose from based on your child’s individual interests. Worried about the mess? Ask one of the flight attendants for a couple of blankets to place on your laps before you start playing. Whenever my daughter discovers a new TV show she loves, I immediately hop over to Amazon to see if I can find a felt, magnetic, or sticker play set for it as I find these sets are easy to transport and keep her busy for hours when we’re traveling. We’ve had many sets over the years – Dora, Thomas and Friends, Spongebob Squarepants, Sesame Street, Peppa Pig – and they are ALWAYS a huge hit! Why not develop your child’s focus, visual perception, speech-language, and fine motor skills while you’re traveling?! There are so many different versions of Spot It (we love our Finding Dory Spot It Game! ), and since it’s suitable for 2-8 players, it will provide lots of fun for the whole family on long-haul flights. If your child likes to draw, the Aquadoodle offers a mess-free way to get creative in the air! The only challenge with this game is that it can get loud, so you may want to reserve it for flight delays when you’re stuck in airport with nothing to do! These sticker sets are always a fabulous distraction when my daughter reaches her saturation point during long flights. I peel, she sticks, and together we make some pretty amazing creations! This is a timeless classic that has offered us hours of fun while on the go. I was on the fence about this one, but it ended up being a ton of fun. I forget about the case and put everything in a ziplock bag to save on space, and while I still don’t understand why Wikki Stix are so popular, my daughter and pretty much every kid under the sun seems to love them, so they are definitely worth a try. If your kids don’t own any sticky mosaics, you’re seriously missing out! Little kids will need help understanding where to stick the stickers, but older kids can get lost in mosaic activities for hours. There are tons of designs for girls and boys, and they make for a great distraction on long fligths. I bought my daughter her first LeapFrog tablet when she was 16-months-old (true story) and had immediate buyers remorse as I was convinced she was way too young to grasp all it had to offer. I was so very wrong. She mastered it within a week, and we have gone through FIVE LeapFrog tablets since then. Each generation has offered something unique and exciting, but the Epic has by far been my favorite as it has an amazingly fast load time compared to the older models and offers heaps of fun things to do for kids of all ages. From videos and games to ebooks and kid-safe web browsing, it’s the perfect travel companion for little kids! I’ve always been a sucker for word searches, but I wasn’t convinced my little one would sit still long enough to try one out with me. I typically save this for the end of a long flight when she’s tired enough to focus, and find it’s a great way to pass the time when we’re landing and can’t turn on our electronic devices. This set includes all the classics – Crazy 8’s, Old Maid, War, Fish, Slapjack, and Memory – and I’ve enjoyed playing them with my daughter just as much as my mom enjoyed playing them with me when I was a kid! Oh, and if you want to be equipped with some of the best toys for airplane travel without spending a dime, make some of these busy bags or try some of these DIY travel activity ideas. They were a real hit with my daughter when she was younger! If you liked this collection of the best toys for airplane travel, please share it on Pinterest!